We ship thousands of items weekly, and constantly are doing our best to improve the speed of delivery. For only $2.99 you can have your order moved to the front of the line assuring your items to be processed and shipped in 24 hours. PLEASE NOTE (We are open only Monday-Friday. All orders Placed on Friday will ship out on the following Monday, However all orders with Rushed Shipping go first and are guranteed to leave on Monday. 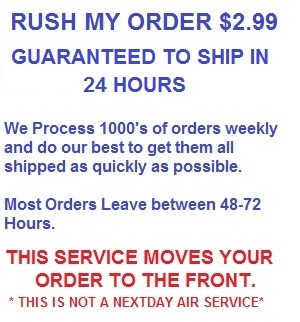 Normal processing time is 48 to 72 hours after order is received. YOu might consider advertising on some of the Kayak fishing publications or with some on the clubs. Kayak fishing is becoming quite popular. I would say that 95+% of the competative fishermen and 50% of the casual kayak fishermen use fish finders and are also trying to keep the weight down. Email me and I can explain more if interested.